The first licensee of the Inkerman was Henry Travers in 1861 after the hotel was built in 1859. Billy Duncan, the famous jockey who rode Phar Lap, owned the Inkerman in the early 1970s and is said to have kept a horse trough outside the front of the hotel! At that time, the Inkerman had a lounge known as the Snake Pit, with no live music, only a single jukebox. A Marmsbury man named Jeff Andrews, but known locally only as Rabbit, was also a regular at the Inkerman during this period. Although he lived in Melbourne during the week, every weekend he returned to Marmsbury, and every Monday night the hotel was full of the rabbits that Andrews was selling for a dollar a pair! Strippers were featured at the Inkerman on Friday afternoons, yet this practice was stopped with the arrival of current owners, William Drake, a former Footscray player who was part of the team that won the 1956 Grand Final. Popular amongst sportsmen - football players and boxers, including the Australian champion Barry Michaels - the introduction of large screen televisions has cemented its reputation as a sports bar. The 2002 boxing match between Lewis and Tyson attracted 750 punters. There are a few residents upstairs, sustaining a function that most contemporary hotels have abandoned. The only remaining hotel on Inkerman Street east of St Kilda Road, the pub’s adjoining bistro was converted to the upmarket Syrup Lounge in March 2002. 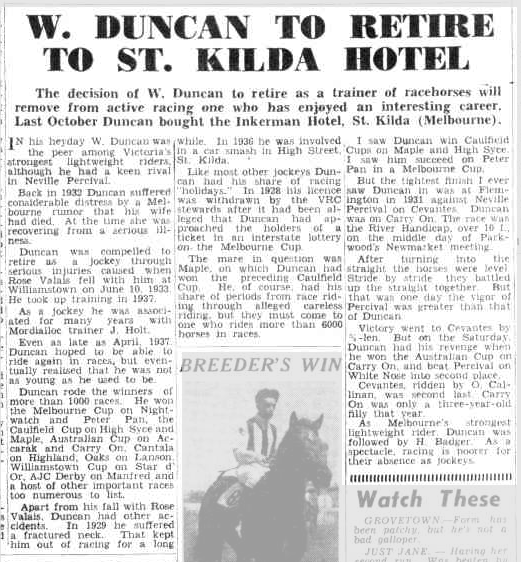 W. W. Duncan, former champion jockey, was yester day granted a licence by the Licensing Court to conduct the Inkerman Hotel, Balaclava. 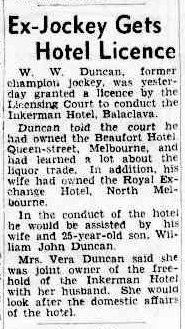 Duncan told the court he had owned the Beaufort Hotel, Queen-street, Melbourne, and had learned a lot about the liquor trade. In addition, his wife had owned the Royal Ex change Hotel, North Melbourne. In the conduct of the hotel he would bfe assisted by his wife and 25-year-old son, Wil liam John Duncan. Mrs. Vera Duncan said she was joint owner of the free hold of the Inkerman Hotel with her husband. She would look after the domestic affairs of the hotel. Shortly after closing 'time on Saturday, while the staff was occupied fully, thieves entered the office of Inkerman Hotel, Inkerman-street, East St. Kilda, and stole £290 in notes from a roll-top desk. The money belonged to the licensee (Mr. E. B. Young). The decision of W. Duncan to retire as a trainer of racehorses will remove from active racing one who has enjoyed an interesting career. Last October Duncan bought the Inkerman Hotel, St. Kilda (Melbourne). TN his heyday W. Duncan was the peer among Victoria's strongest lightweight riders, although he had a keen rival in Neville Percival. Back in 1932 Duncan suffered considerable distress by a Melbourne rumor that his wife had died. At the time she was recovering from a serious illness. Duncan was compelled to retire as a jockey through serious injuries caused when Rose Valais fell with him at Williamstown on June 10, 1933. I He took up training in 1937. As a jockey he was associated for many years with Mordialloc trainer J. Holt. Even as late as April, 1937. Duncan hoped to be able to ride again in races, but eventually realised that he was not as young as he used to be. Duncan rode the winners of more than 1000 races. He won the Melbourne Cup on Night- j watch and Peter Pan, the Caulfield Cup on High Syce and Maple, Australian Cup on Accarak and Carry On, Cantala on Highland, Oaks on Lanson. Williamstown Cup on Star d' Or, AJC Derby on Manfred and a host of other important races too numerous to list. Apart from his fall with Rose Valais, Duncan had other accidents. In 1929 he suffered a fractured neck. That kept him out of racing for a long while. In 1936 he was involved, in a car smash in High Street, St. Kilda. Like most other jockeys Dun can had his share of racing"holidays." In 1928 his licence was withdrawn by the VRC stewards after it had been alleged that Duncan had approached the holders of a ticket in an interstate lottery on. the Melbourne Cup. The mare in question was I Maple, on which Duncan had won the preceding Caulfield Cup. He, of course, had his I share of periods from race riding through alleged careless riding, but they must come to one who rides more than 6000 horses in races. I saw Duncan win Caulfield Cups on Maple and High Syce. I saw him succeed on Peter Pan in a Melbourne Cup. But the tightest finish I ever saw Duncan in was at Flemington in 1931 against Neville Percival on Cevantes. Duncan was on Carry On. The race was the River Handicap, over 10 f., on the middle day of Park- wood's Newmarket meeting. After turning into the straight the horses were level. Stride by stride they battled (up the straight together. But that was one day the vigor of Percival was greater than that of Duncan. Victory went to Cevantes by 3/4-len. But on the Saturday. Duncan had his revenge when he won the Australian Cup on Carry On, and beat Percival on White Nose into second place. Cevantes, ridden by O. Callinan, was second last. Carry On was only a three-year-old filly that year. As Melbourne's strongest lightweight rider. Duncan was followed by H. Badger. As a spectacle, racing is poorer for their absence as jockeys.